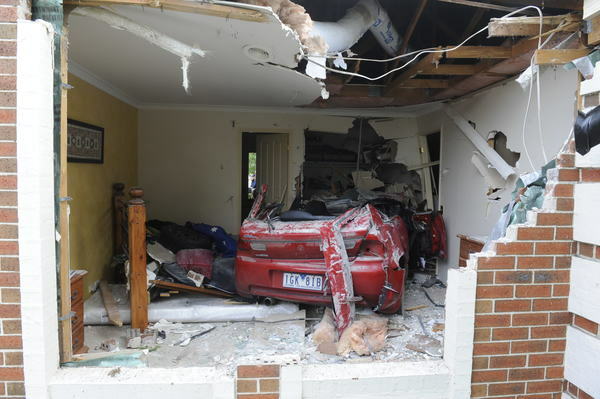 Residents are calling for urgent safety upgrades after an out-of-control ploughed into a family home’s bedroom at high speed at The Promenade, Narre Warren South on 9 April. 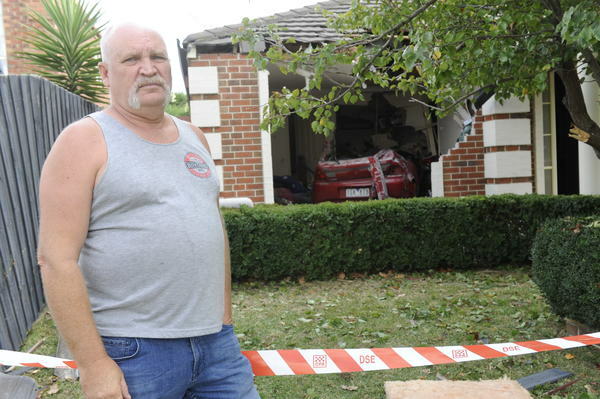 The driver, a Cranbourne North man in his 40s, was said to have been overcome by a medical condition when his red Mazda missed the tight bend and launched airborne up a lawn rise into the brick home about 7.20am. He was extracted from his car wedged in rubble and the bedroom’s walk-in wardrobe. He was hospitalised in a stable condition with chest injuries and grazes, and is not expected to be charged. 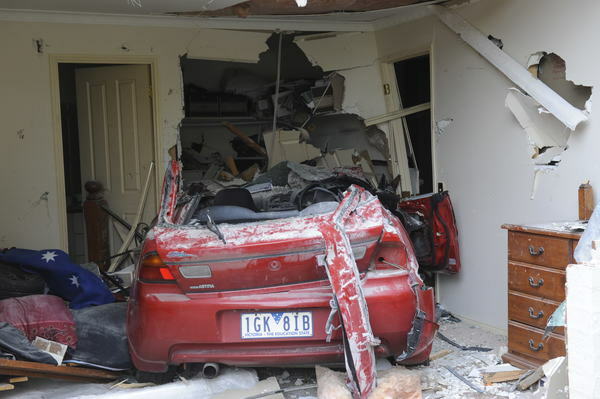 Fortunately, none of the home’s occupants were in the car’s path at the time. One of the residents, a shift-work nurse, would often be sleeping off in the same bedroom at that time of morning. 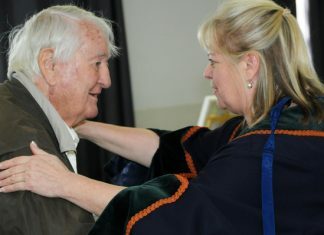 The owner of the house, Jamie Moroney spoke of his shock saying he had left for work just minutes before the accident. “My son rang me. He straight away freaked out because he wasn’t sure that I’d left for work,” he said. His son was about to have breakfast in the kitchen but luckily not injured, he said. Mr Moroney said he found the car sitting on top of his bed, adding the driver was incoherent and “didn’t know what was going on”. “The roof was crashed down on top of him,” he said. Mr Moroney said the car took out two windows and caused extensive damage to the brick work. “There’s about two metres of damage on the front lawn and then he’s gone through the air,” he said. Mr Moroney said had it not been for his wife’s roster she could have easily been killed. It is the second crash on the property in recent months. Neighbours say the brick letterbox at the front was damaged by an out-of-control vehicle about six months ago. The road adjoins Hillsmeade Primary School and is frequently blighted by hoons, sliding around the corner especially in wet conditions, neighbours say. Casey Council’s city design and construction manager Trevor Griffin said the council would conduct a survey of the housing estate’s roads including The Promenade to “assess the need for traffic calming devices”. Chris Politis, a resident on the corner, described the council’s response as “disappointing”. “I think we might have to have a barrier there before something serious happens in the area. “If there was some sort of barrier there it could have veered the driver away from the house. The corner is at the end of a 400-metre straight starting from a roundabout at Robinswood Parade. The stretch is unimpeded by traffic controls but for a set of rubber speed humps about 200 metres from the corner. A former traffic island just before the corner successfully slowed down vehicles, neighbour Chris Hyde said. The island was removed to allow buses to steer around the corner some years ago, he said. Mr Hyde heard the “whoosh” of a car as it “barrelled” down The Promenade apparently well above the 40 km/h speed limit. “It hit the kerb, and hit the fence, then there was that sickening thud,” he said.